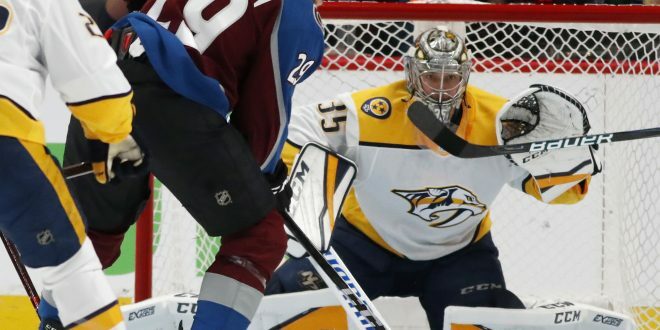 The Colorado Avalanche secured a 5-3 win against the Nashville Predators on Monday night. The Avalanche came into Monday night’s game desperate for a win. Nashville had a 2-0 lead in the seven-game series. The underdog Colorado created 4-0 lead during the game to land them a 5-3 victory. 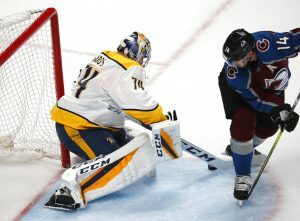 The last time the Predators lost to the Avalanche was around two and half years ago; Monday night’s win snapped Colorado’s 12 game losing streak to Nashville. Within the first two minutes of the game, Blake Comeau got the puck past Pekka Rinne. Pepsi Center began to roar of excitement when Gabriel Bourque got the second goal of the night at 13:24. Then, center Nathan MacKinnon set the ice rink on fire, scoring the third and fourth goals of the night. Wingers Gabriel Landeskog and Mikko Rantanen along with MacKinnon, the “MGM” line, proved to be a powerhouse for Colorado. With a little over 1:30 left in the game, Landeskog locked in the fifth goal. Head coach for Colorado Jared Bednar was proud of the team for the energy they brought to the game. MacKinnon was the deciding factor for this game and if he continues to play as he did on Monday night, he will be able to help secure the team to the next round. From a defensive standpoint, Colorado is continuing to power through despite not having Erik Johnson and Samuel Girard in the game. Bednar said he hopes Girard will able to be back in the lineup soon. In a seven-game series, coming back from a 2-0 series deficit is huge, but they still have to win a few more games for a spot in the next round. Colorado has come together as a team and under intense pressure, they were able to deliver a much-need victory. Now, they will have to take this drive to Nashville when they play Game 4 on Wednesday, April 18.